CIUDAD JUÁREZ, Mexico — More than two months after leaving Honduras to seek asylum in the United States, Misael Acosta and Katherine Molina finally stepped foot on American soil last Thursday with their two young daughters. Their stay in the United States lasted less than 36 hours. Acosta and Molina weren't among the tens of thousands of asylum seekers who have overwhelmed U.S. Border Patrol agents in recent months by crossing the Rio Grande and turning themselves in. Rather, they did what immigration hardliners in the U.S. government argue is the “right way” to seek refuge — by crossing through a port of entry. Still, the young couple on Friday found themselves in the same Mexican border city where they had waited for more than a month before seeking refuge in Texas. The family is part of the first large wave of asylum seekers in West Texas who have been returned to Mexico under the expansion of a controversial program called the Migrant Protection Protocols. The program, also known as “remain in Mexico,” began in California in January and was expanded to the El Paso ports of entries last month; it requires asylum seekers to wait in Mexico until their court dates before an American judge. On Monday, a federal judge in California ordered the program to be put on temporary hold by the end of this week, dealing another blow to the Trump administration's efforts to dissuade asylum seekers from crossing the border. But because Acosta's family had been sent to Mexico before Monday's ruling, they and hundreds of others could be forced to remain in Mexico until their hearing dates, said Judy Rabinovitz, deputy director of the American Civil Liberties Union’s Immigrants’ Rights Project. The ACLU was one of several groups that challenged the federal policy in court. The family's court date is April 25. "When they come back on that day, they cannot be sent back, assuming the injunction holds," Rabinovitz said. But whether Acosta or others in the same situation will be allowed into the United States before their court dates is another question. "We’re going to have to explore if there is some way to get them relief sooner,” Rabinovitz said. "The problem is, logistically, how to get them back to the United States." 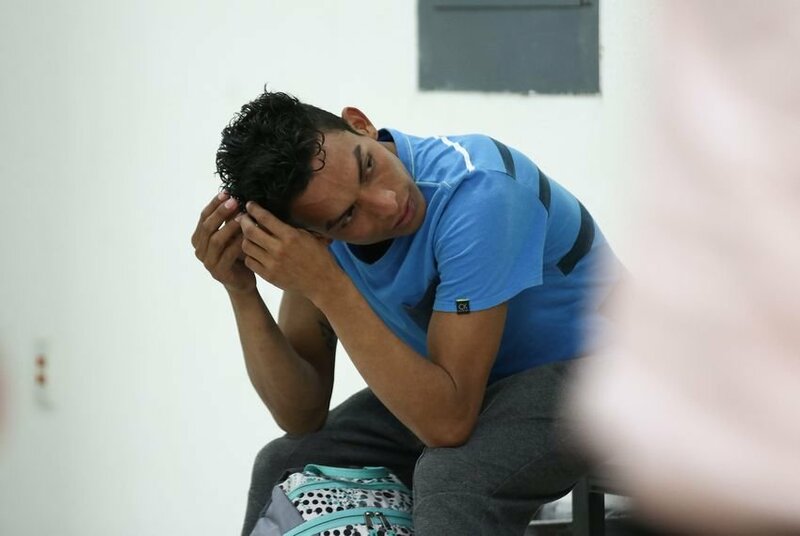 As of Friday, 169 migrants had been returned to Ciudad Juárez from Texas, according to Enrique Valenzuela, director of Ciudad Juárez’s Centro de Atención a Migrantes, a migrant transition facility operated by the Chihuahua state government. That figure didn’t include the group Acosta and Molina arrived with, and Valenzuela said Friday he expected about 60 more to be dropped off later in the day. Valenzuela said most of the 11 shelters that coordinate with his agency already are at capacity. For now, the migrants who were sent back across the border will be left to fend for themselves in Mexico. Acosta and Molina said they were told Juárez's shelters were full, and they were hoping to find space at a Red Cross facility in Mexico. "People have no way to support themselves. They have no security there; they have no place to live, no work," Rabinovitz said. Acosta said the family fled Honduras after gangs threatened Molina after a fight she had with an opposing player during a soccer match. The other woman’s brother was a local gang leader who Molina said threatened the couple’s lives, ransacked their home and told them to leave town. After the couple filed a complaint with the local police, the officer in charge told them their best option would be to leave the county, Molina said. They decided to set out for the United States on Jan. 29 and joined one of several large groups that have made their way to the United States since last year. Now they're struggling to figure out how to find a lawyer to help them argue to a judge that they have a legitimate reason to stay in the United States. If the judge's decision stands, it would be some welcome relief for Valenzuela. Hours before Molina and Acosta arrived at this state-run facility, Valenzuela said more arrivals from the U.S. would have pushed the limits of an already strained shelter network in Ciudad Juárez that’s been overwhelmed with asylum seekers for months. Valenzuela said most of the 11 shelters that coordinate with his agency already are at capacity. The center opened in November and was originally intended to take an influx of deported Mexicans from the United States. Valenzuela said officials have been forced to accommodate more asylum seekers from Central America and an ever-increasing number of Cubans who also have been forced to wait in Mexico until their asylum claims can be heard by judges. Since the center opened, more than 10,600 asylum seekers have passed through and placed their names on a waiting list Valenzuela said is being managed by the Mexican government. As of Friday, about 7,100 of them had had their numbers called and applied for asylum in the United States. It's unclear how many of those applicants had been returned to Mexico under the U.S. protocol. On top of the asylum seekers from other countries, Valenzuela said, his agency receives about 1,600 deported Mexicans every month, many of whom aren’t local and need help arranging travel to other parts of Mexico. The migrant influx is happening as Ciudad Juárez grapples with a new crime wave — multiple homicides in one day are still common. On April 2, the city saw nine murders, followed by a pre-dawn attack on the state police headquarters the next day, according to El Diario de Juárez.